Travelling to one of the areas of Pakistan worst affected by this summer's devastating floods, Jane Corbin finds a community struggling to cope. The water stretched as far as the eye could see, with only the tops of trees showing that the Dadu in Sindh had once been a fertile and productive agricultural plain. But, after 30 years of visiting and reporting from Pakistan, I found the sight of the flooded city of KN Shah even more shocking and surreal. Some 200,000 people once lived there. Now half of them had fled - and the rest were stranded in what remained of the city after it was inundated by water. Gaunt men on rooftops gestured wildly at us, as animals and children clustered around them above the swirling muddy waves. Concrete walls, collapsed bridges and broken electricity pylons reared out of the flood water which must have been 10 feet deep. The World Bank estimates the floods that struck Pakistan in July and August have caused nearly $10 billion worth of damage to the infrastructure of a country already deep in debt. Five months later, huge areas of the country are still stricken, and farming families who once provided for themselves and for others through the crops they grew are reduced to the status of helpless supplicants, still unable even to make a start on rebuilding their lives and livelihoods. My first sight of the havoc the floods have wrought was from a Pakistani Navy hovercraft, as with a camera crew and accompanied by a leading doctor I travelled the area by the only means possible. Along the flooded streets, electric cables sparked menacingly and iron girders lurked below the surface to snag boat propellers. Back in October, no helicopter could land here either, and the navy commandos urged me to beware of poisonous snakes, which would drop from the trees above. I had come to KN Shah with Dr Shershah Syed, a surgeon from Karachi, who was responding to an SOS call to bring desperately needed medicines to the city. As we landed on a patch of high ground, people clustered around and although it was clear that many were sick it was equally clear that what they really needed was food. An emaciated woman held out a limp and scrawny baby and demanded rice. She said they had eaten nothing all day. The doctor set up a clinic at the landing point where people bring children suffering from diarrhoea. In the wake of the flood, disease has spread: across Pakistan there have been 99 cases of flood-borne cholera, 15 deaths from dengue fever and many more among young children from diarrhoea. As small navy dinghies arrived and commandos started unloading bags of rice, people who had heard that food was on its way ran towards us. Lieutenant Zeeshan Yousuf Zaidi, the officer in charge, pushed them quickly into a line, afraid the situation would spiral out of control even though people were weak and looked dejected. "They are desperate for food," he said. "This is only the third time we have been able to come over here – the problem is it's so remote." Apart from the navy boats there was no sign of any government relief effort. The Navy is popular and saved many lives during the flood, but the people here, as elsewhere in Pakistan, say the government abandoned them. "There's no proper distribution system," one man told us. "Some people get more than they need but we're not getting enough." Along a narrow embankment which stretched for miles above the waters, thousands of people were living with their animals, without proper shelter or regular food. The shocking fact about events in Pakistan is that even now, almost two months after this journey in late October, so little has improved. Large areas of Sindh remain under water. 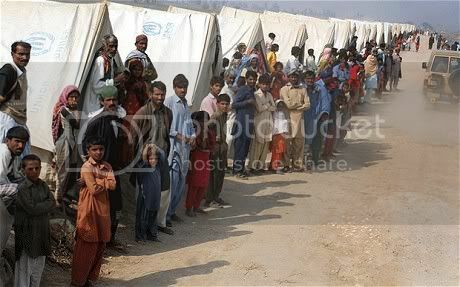 Tents, long lines of white canvas along the embankments, have been erected for the many families made homeless as an estimated 1.6 million houses countrywide were damaged or destroyed by the flood waters. But, as the chill of winter sets in, there are still an estimated 600,000 families without even emergency shelter. The Pakistani government announced last month that it would spend a further 200 milloion rupees (£1.5 million) rehabilitating flood victims in Dadu, and insists it is doing all it can to help the victims. But even proud supporters of the country like Dr Shershah, a social campaigner who received his medical training in Britain and vowed to improve conditions in Pakistan, find the apparent failure of the institutions of government hard to take. It is individuals like him, from Pakistan's growing but frustrated middle class, who are driving much of the relief effort. On a tiny patch of land in the water we discovered a group of women and children huddled in a washed-out compound. They had fled here from their own village as the floods rose and their men took the animals to higher ground. The women were weak, hungry and above all afraid – this is bandit country and criminals roam in boats at night looting what little people have left. "We are all alone," Sherbano said as she held her sick mother's hand. "We have no food or water, the men just abandoned us." The women were dangerously anaemic. Poor labourers, weakened by constant childbearing and lack of food even before the flood, they were now on the edge of starvation. "This is the result of decades of government failure," said Dr Shershah. "It is criminal to have a country with an atomic bomb, yet where such poor people live." Today KN Shah remains under three feet of water and community leaders say the government is still failing to help them. The UN has delivered food in recent weeks but has warned that Dadu faces a protracted emergency well into next year. There still aren't enough tents, despite government promises to provide them. So saturated is the soil that it could take another three to six months for the waters to subside. Near the town of Sukkur the camps set up for some flood victims are full of landless labourers like Maluk Sheikh and his wife Gholamee – her name means "slave", an indication of her status in this feudal society. They worked for their landlord for a share of the crop and were already in his debt. Now their village and fields are flooded and they won't be able to grow rice for a year. Their story revealed another failure by the government. There were 17 family members in the camp, desperate for the compensation which had been promised to the married men in each household: 20,000 rupees (£150) for each family, equivalent to four months' wages for a labourer. Yet securing their entitlement was not simple and there were widespread complaints that this system was open to abuse. I heard several reports of bank guards demanding bribes to help people get access to their cash. At a school near the camp hundreds of men battled to get through the gates – held back by sweating policemen with big sticks. "They are taking 3,000 rupees (£22) from us to get to the front of the queue," protested one man, who didn't want to give his name. "I've been coming here for 15 days and haven't got a penny." Others crowd round with similar stories to tell of corruption as they tried to obtain their so-called "watan card" – exchangeable for money in an ATM cash machine. Pakistan has the biggest electronic identity card system in the world and it was incongruous to see barefoot men wearing rags having their photographs and thumb prints taken by high-tech scanners. Because he had lost his identity card, Maluk could not prove where he was from, and so his plea for compensation was rejected until he could obtain a new ID. His father Ghulam's application was approved, however, enabling him to return to his village, 80 miles away. Days later they and their family waded through water to what was left of their homes, carrying beds and trunks on their heads, with babies strapped to the women's backs. The walls of their house were still standing but the roof and all the contents had been washed away. The family would need food aid for at least a year, just to survive. "I will be able to stay in my village now and try and rebuild our lives, thanks to the watan card," said Ghulam Haider. "Without it we were in a hopeless situation." Their desperate plight is being repeated all over Pakistan as foreign donors prove reluctant to give to a country with a reputation for militancy and corruption, and the Pakistan government struggles to cope in the aftermath of the floods. So far less than half the UN's appeal for nearly $2 billion in aid has been met. "The world's attention is waning but millions still need assistance," said Baroness Amos, the former British minister who is now the UN official in charge of humanitarian and emergency aid and visited the relief effort last week. "The world must not close its eyes to the needs of Pakistan's people." and did we get to hear about the flood in pakistan in the kkl controlled news? on the other hand, fire in israhell (caused by a chosen one) gets 24/7 coverage.